Difficult to awaken after sleeping? Fall asleep often in the daytime? Do you or your child/adolescent seem lethargic, depressed, irritable and oppositional, defiant, moody, have poor motivation, or fall asleep frequently in class? 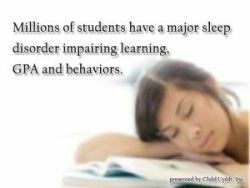 This is not normal for children or adults and is one of the best indicators of a serious sleep disorder such as Obstructive Sleep Apnea Syndrome (OSAS), Narcolepsy, Delayed Sleep Phase Syndrome (DSPS), or Periodic Limb Movement Disorder (PLMD). If some of these characteristics sound like you or your child, then read below how you can screen for Excessive Daytime Sleepiness and other sleep problems/disorders by clicking here “Parent Screen Your Child” (even for adults) to screen for the major sleep disorders in children, teenagers, and adults. Excessive Daytime Sleepiness is not a “Sleep Disorder”, but it is often the negative result or one of the main symptoms of a sleep disorder. It is frequently an indication of the degree to which a sleep disorder or another medical problem is negatively affecting the person’s daytime alertness, learning, and behaviors. Excessive Daytime Sleepiness is not as noticeable in younger children as adolescents or adults because parents expect young children to sleep more at night and take daytime naps. 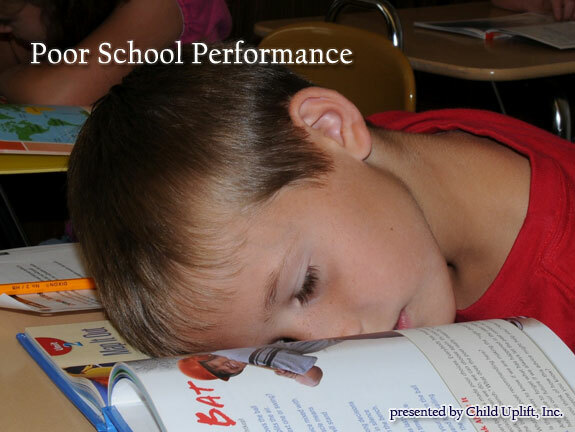 Excessive Daytime Sleepiness is often characterized not only by sleepiness, but by behavioral deterioration, irritability, yelling, lack of motivation, or defiance in doing requests when the child or adult has the capability of doing the requested task. They become irritable because they don't feel like they have the energy to do whatever is being asked of them. If napping is occurring frequently during the daytime, adults need to monitor how often naps occur, how long naps last, how easy is it to awaken the person, and whether s/he appears to be refreshed after the nap or continues to be tired. Teachers need to report this information to parents, and the parent may need to ask the teachers if they have noticed lots of Excessive Daytime Sleepiness in school if they are seeing it at home. If teachers confirm this problem at school, then the parent needs to consult with the pediatrician or a sleep specialist when Excessive Daytime Sleepiness is occurring. Excessive Daytime Sleepiness can be a sign of the existence of a major sleep disorder such as Obstructive Sleep Apnea Syndrome (OSAS), Periodic Limb Movement Disorder (PLMD), Delayed Sleep Phase Syndrome (DSPS), Narcolepsy (NARC), or another sleep disorder. In rare situations, Excessive Daytime Sleepiness can be caused by other medical disorders such as nocturnal seizures, Kleine-Levin Syndrome, Menstrual-Associated Periodic Hypersomnia, Idiopathic Central Nervous System Hypersomnia, etc. The above-mentioned sleep disorders and medical conditions can only be diagnosed by a sleep specialist or other medical professionals and may warrant further investigation if you or your child is exhibiting excessive daytime sleepiness. On the Sleep Disorders Inventory for Students - Adolescent Form, if the Excessive Daytime Sleepiness and Narcolepsy scales are elevated, but not the Obstructive Sleep Apnea Scale, then there is a possibility that this adolescent or adult might have the beginning signs of Narcolepsy. Both Obstructive Sleep Apnea Syndrome and Narcolepsy are very serious, harmful sleep disorders that need immediate treatment before serious health problems, school/work problems, or harmful accidents occur to you or your child/teen. If you would immediately like to screen yourself or your child / teen for Excessive Daytime Sleepiness and other major sleep problems/disorders with the Sleep Disorders Inventory for Students, please click onto “Parent Screen Your Child” below (even adults can use this screening).